Random quirkiness doesn’t elevate a romantic comedy. I would actually argue that the romantic comedy angle is the better part of the film. There’s a pretty great twist with the handsome stranger (that could have been guessed if paying close attention, but will come as a surprise to most), and another solid twist between Eloise and her ex, Teddy. Half-surprising, half-disappointing, Kendrick as Eloise and screen partner Wyatt Russell as Teddy were the only actors in the group that could make the Duplass brothers’ dialogue sound natural. Tony Revolori as "Renzo" in TABLE 19. Photo by Jace Downs. 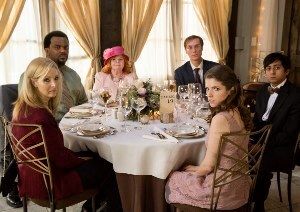 The other half of the movie is the quirky, indie comedy, highlighted by the “randoms” seated at table 19 with Eloise. The movie goes to great lengths to show how maladjusted these people are, how clueless they are to their lot in life, and how different they are from one another – and everybody else at the wedding. Part of that is handled well, some adept development at Eloise’s character, showing her abruptness in trying to demonstrate to these people how their presence at this wedding is completely pointless, but at the same time accepting that she’s now one of them. The other part of this is that the film spends way too long introducing these characters and way too long on their very forced humour. Only one of them was used appropriately – June Squibb in the role of Nanny Jo, who also had excellent delivery of her lines. The others as a group could adequately propel the plot and add a bit of humour to the story, but individually had painful storylines and their attempts at jokes fell flat. Most romantic comedies survive on the lead characters and their chemistry. Kendrick and Russell don’t have outstanding chemistry by any stretch, but both have good screen presence and Kendrick is, as usual, adorably charismatic. Teddy for the most part is a typical dumb, frat-boy-like man, but does get one beautiful moment of eloquence to let us see the good in him. Eloise is a better-crafted character; she is very engaging with a string of poor choices, but for the most part, knows that about herself, and ultimately ends up sharing a lot of traits with Teddy. But that really doesn’t elevate Table 19 above an average romantic comedy: a funny lead, and an unfunny obsession with random quirkiness.